Microsoft Windows 7 Administrators Reference covers various aspects of Windows 7 systems, including its general information as well as installation and upgrades. This reference explains how to deploy, use, and manage the operating system. The book is divided into 10 chapters. Chapter 1 introduces the Windows 7 and the rationale of releasing this operating system. The next chapter discusses how an administrator can install and upgrade the old operating system from Windows Vista to Windows 7. The deployment of Windows 7 in an organization or other environment is then explained. It also provides the information needed to deploy Windows 7 easily and quickly for both the administrator and end users. Furthermore, the book provides the features of Windows 7 and the ways to manage it properly. The remaining chapters discuss how to secure Windows 7, as well as how to troubleshoot it. 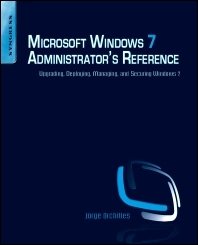 This book will serve as a reference and guide for those who want to utilize Windows 7. Jorge Orchilles began his career as a network and system administrator for a small private high school he attended. Realizing his passion for IT, he opened up a branch of a small business in 2002, The Business Strategy Partners - IT Consultants. Here he began serving residential and small business clients in the South Florida area as an IT consultant. Jorge currently holds a position as a security operating center analyst while pursuing a Master of Science in Management Information Systems in Florida International University and being involved in various IT, security, and business organizations in the South Florida area. He also holds a BBA in MIS from FIU. Jorge is a Cisco Certified Design Associate (CCDA), Cisco Security Solutions for System Engineers (SSSE), CompTIA Security+ (2008), Microsoft Certified Professional (70-228, 70-282, 70-284), and Microsoft Certified Technology Specialist (70-620).